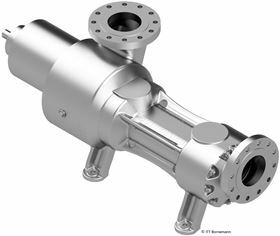 ITT Bornemann has launched the SLW, a hermetically-sealed twin-screw pump for the chemical and petrochemical sectors. The pump was unveiled on a Facebook Live broadcast during the ACHEMA exhibition and congress, a triennial world forum for the process industries, being held in Frankfurt this week. Designed for applications in the chemical, oil & gas, tank storage, shipbuilding, power generation and general industrial markets, the SLW Series uses magnetic coupling (MAG-Drive), which eliminates the need for mechanical seals and complex seal supply systems. Its sealed chamber means that critical media with harmful substances are confined to the pump and not released into the environment. The design allows the two screws to convey the product and transmit the torque. It’s also compact, requiring a small footprint for installation and the product is lubricated with inboard bearings. There will also be a range of other products on display from ITT brands, including engineered solutions in virtual reality. Alongside Bornemann will be the brands Engineered Valves, Goulds Pumps and PRO Services showcasing pumps, valves and monitoring and control products. Highlights include the recently released i-ALERT 2 equipment monitoring device and pressure sensor, which offers advanced features in monitoring all types of rotating equipment. The teams will be in Hall 8.0, at Booths E63 & L97. Next evolution in machine health monitoring and the ’Industrial Internet of Things’— the i-ALERT Ai platform is launched.